« The Great Kugel Cook Off! Discovery and Recovery: Preserving Iraqi Jewish Heritage details the dramatic recovery of historic materials relating to the Jewish community in Iraq from a flooded basement in Saddam Hussein’s intelligence headquarters, and the National Archives’ ongoing work in support of U.S. Government efforts to preserve these materials. In both English and Arabic, the 2,000 square foot exhibit features 23 recovered items and a “behind the scenes” video of the fascinating yet painstaking preservation process. This exhibit was created by the National Archives and Records Administration, with generous support from the U.S. Department of State. A lunar calendar in both Hebrew and Arabic from the Jewish year 5732 (1971-1972) – one of the last examples of Hebrew printing produced in Baghdad. 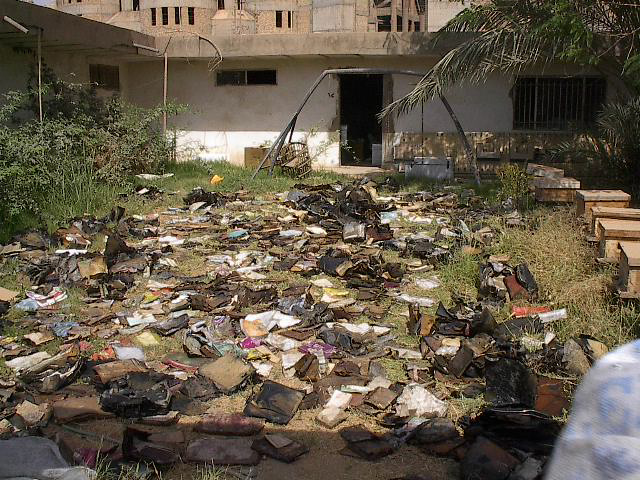 Materials drying outside the Mukhabarat, Saddam Hussein’s intelligence headquarters. Discovery: The dramatic story of how these materials were found, rescued and preserved is one worthy of a Hollywood blockbuster. A short film captures these heroic efforts. The section includes the actual metal foot lockers used to ship the documents to the United States. 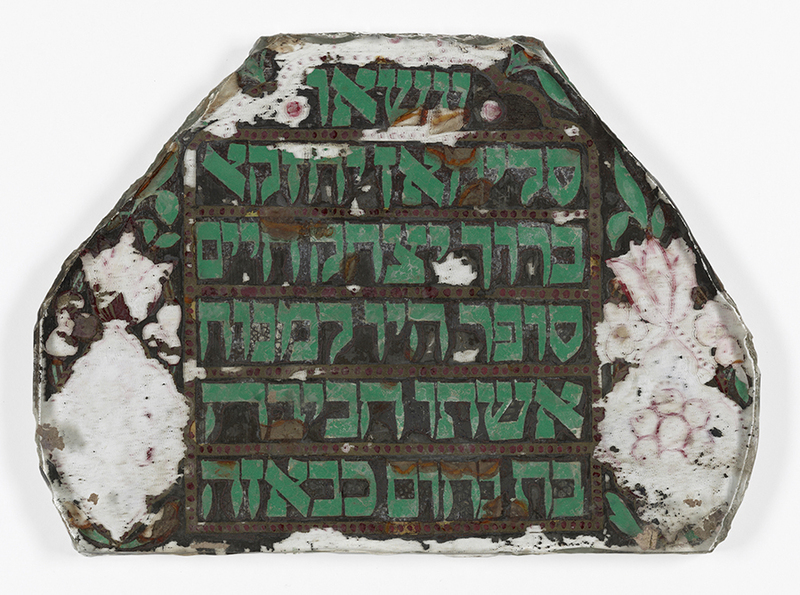 Text and Heritage: This section explores Iraqi Jewish history and tradition through recovered texts, including a Torah scroll fragment, a Hebrew Bible with Commentaries from 1568, and a Babylonian Talmud from 1793. Iraqi Jewish Life: Constancy and Change: Using recovered texts, this section explores the pattern of Jewish life in Iraq. Highlights include a Haggadah (Passover script), siddur (prayer book) and an illustrated lunar calendar in both Hebrew and Arabic (one of about 20 found that date from 1959-1973). Personal and Communal Life: Selected correspondence and publications illustrate the range and complexity of Iraqi Jewish life in the 19th and 20th centuries. Original documents and facsimiles in flipbooks range from school primers to international business correspondence from the Sassoon family. After the Millennia: Iraqi Jewish life unraveled in the mid-20th century, with the rise of Naziism and proliferation of anti-Jewish propaganda. In June 1941, 180 Jews were killed and hundreds injured in an anti-Jewish attack in Baghdad. Persecution increased when Iraq entered the war against the new State of Israel in 1948. In 1950 and 1951, many Iraqi Jews were stripped of their citizenship and assets and the community fled the county en masse. This section includes the 1951 law freezing assets of Iraqi Jews. Detail of Tik (Torah case) and Glass Panel from Baghdad, 19th-20th centuries. In Jewish communities throughout the Middle East, the Torah scroll is generally housed in a rigid “tik” or case made of wood or metal. This exhibit is made possible, in part, through the generous support of our lead sponsor, The Herbert Bearman Foundation.